An exquisite choker which is consisting of Beige small bead strung together in thick single strand Oval shell pendant with mother of pearl embedded. The most focal point of this Necklace is Oval Pendant outline with abalone with self designed Mother of Pearl embedded on pendant. Which is really unique style. 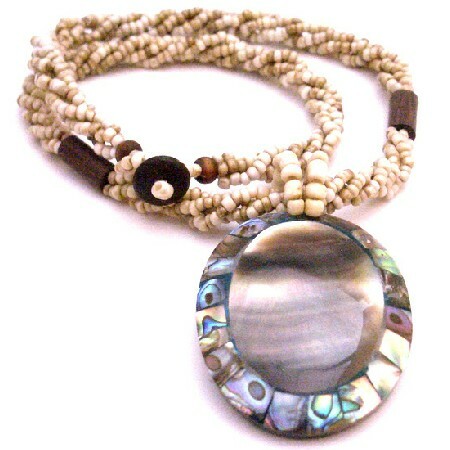 This necklace was professional hand strung each Beige bead. Super Grade RARE HIGHEST QUALITY. Quality A to AA. It is the traditional Jewelry.This necklace is very popular gift for someone you love or special. Good shinning surface quality.